Passengers hoping to cross the Channel by ferry faced further disruption as a strike by SeaFrance workers in Calais continued for a second day. The 48-hour strike by CFDT union members led to the cancellation of all SeaFrance crossings from Dover to Calais on Friday and Saturday. Sea France said it had been contacting passengers by text and e-mail. The company has been transferring customers to ferries run by rival operators. A message on the company's website said: "SeaFrance regrets to advise that its services today are cancelled due to a strike by one of its trade unions. "The company profusely apologises to customers affected. The advice is to arrive as normal and SeaFrance will transfer you to an alternative operator however there may still be considerable delays." The French workers walked out in protest at new working practices. Operation Stack - where lorries waiting to cross the Channel park on the M20 in Kent - was put in place throughout the day on Friday as traffic built up around the port. SeaFrance managing director Robin Wilkins said: "We have been in touch with the vast majority of our customers and we've been trying to help them to overcome this problem. "I'm desperately sorry that it's happened. I'm very angry about it but unfortunately I feel rather powerless to be perfectly honest." Kent Police said Operation Stack would be restarted if traffic around the port returned to high levels on Saturday. The force said the Port of Dover was "still busy" on Saturday night. 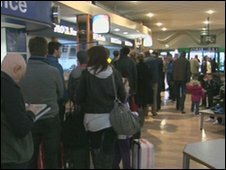 In a statement it said: "People are still being advised to check with their travel operator before starting their Easter journey." Lorry driver Chris Bosman, of East Malling, Kent, told the BBC he was stuck on a ferry for six hours. He said: "The ferry set off quite normally and then when we got to Calais it stopped and stayed outside the harbour and then started just circling round and round and then they announced that there was a delay waiting for a berth. "The problem was, we couldn't go into Calais because the other two super-ferries that SeaFrance use - they use three - were on the SeaFrance berths so there wasn't anywhere for us to go."